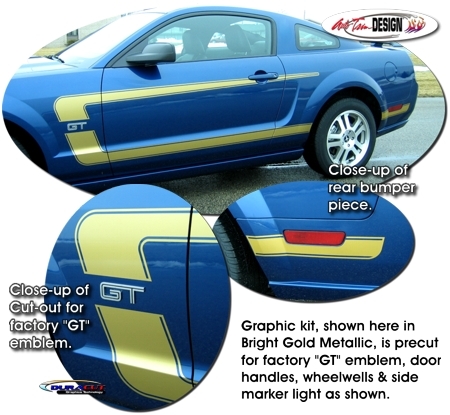 "Grab" some attention with this awesome body side graphic kit for your '05-Current Ford Mustang. This 70's retro Mustang Grabber "C" stylized graphic is very easy to install and features a .2" (5.08mm) pinstripe at each side as shown. Available in a wide variety of colors, graphic set is packaged with one (1) graphic for each side of the vehicle. 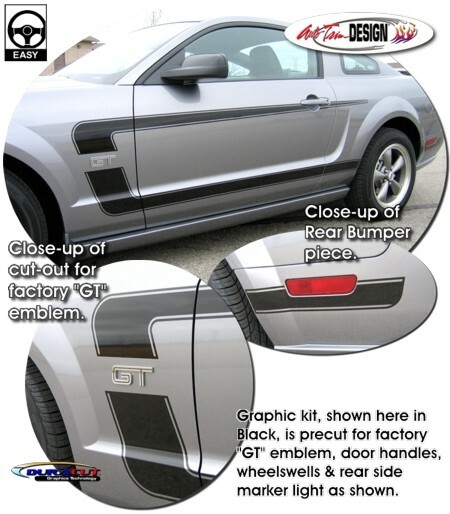 Graphic is specifically set for the '05-Current Ford Mustang V6, GT or 5.0 and will not fit any other vehicle. Choose graphic kit WITH a cutout for the factory side emblem (shown) or WITHOUT (solid). Cutout for factory emblems measures 2.8" (7.11cm) in height. Installation of the graphic kit is very easy (set to install along the vehicle's body lines as shown) and only requires trimming at the door jambs.